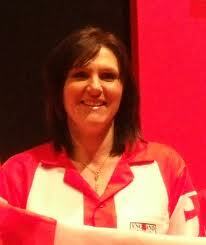 Lorraine Farlam plays darts since 1994 and the years 2010 and 2011 were thus far her most successful years. She is member of three local teams, plays for the county Yorkshire and is member of the English national team. In 2011 she reached the quarterfinals if the Winmau World Masters and the semi-finals of the Czech Open. She was runner-up of the German Open, the England Classic, the BIDO British Classic and the Mariflex Open. She won the Scottish Open, the British Open and the Romanian Open. Thanks to those achievements she qualified for the BDO World Championship 2012. It will be her second time in Lakeside. Farlam is a beauty therapist by profession.